"There was no coup, only a bloodless transition which saw corrupt and crooked persons being arrested and an elderly man who was being taken advantage of by his wife being detained," African National Union-Patriotic Front (ZANU-PF) said on Twitter Wednesday. — ZANU PF (@zanu_pf) 15 ноября 2017 г. "Last night the first family was detained and safe, both for the constitution and the sanity of the nation this was necessary. Neither Zimbabwe nor ZANU are owned by Mugabe and his wife," another statement read. The party also said that a "decision to intervene" had been made because the constitution has been "undermined" and announced that Emmerson Mnangagwa will chair the party during the interim period. Mnangagwa, who was recently sacked by Mugabe as vice president, has been popular with the military and is believed to the most likely successor to the 93-year-old president. It is unclear who exactly wrote the statements on Wednesday, but one of the posts stated that Mnangagwa does not have a Twitter account. He has not appeared publicly since his removal in early November. 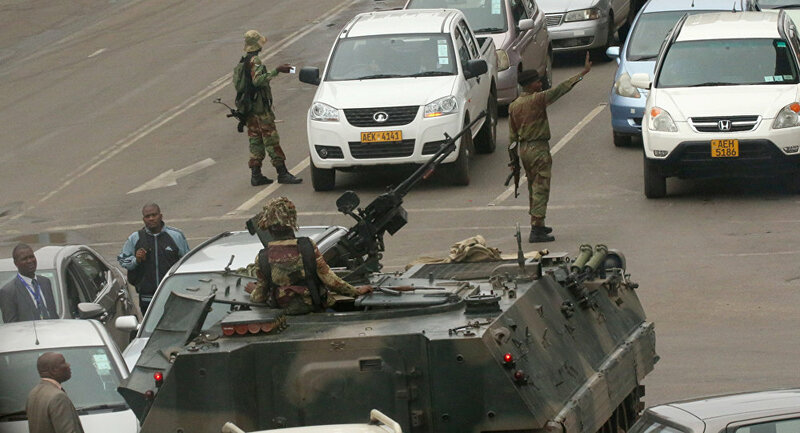 On Tuesday, media reported that armored vehicles had been moving toward the Zimbabwean capital. Media also informed of explosions occurring in Harare, as well as the seizure by the military of the television station in the city. The military has announced that their activities were not a coup but were directed against "criminals." Zimbabwe’s military took over the headquarters of the state broadcaster in Harare and issued a statement, saying that no military takeover is taking place in the country and that President Robert Mugabe and his family are safe and sound. According to the South African News24 website, Mugabe managed to reach an agreement with the army's representatives that his wife would leave the country, while the president himself is preparing to announce his resignation. It has been reported that Mugabe is now under heavy military guard.